It’s great to be back in the office after taking some time off for the holidays. We took a full two weeks off to enjoy all the wonderful things Christmas in the Carolinas brings. I hope your Christmas and New Year’s was a restful time to connect with your family, friends, and self! I get the feeling that, unless it’s Leslie Knope, most people really dislike the idea of making New Year’s Resolutions—or goals, or visualizations, or whatever you want to call them. They definitely get a bad rap. The arguments usually go as follows: You can’t—and won’t—keep your resolutions. No one remembers them past the end of January (if they make it that far!). You’ll just end up feeling guilty or depressed about not achieving what you set out to do. Why would you want to do that to yourself??? You can probably come up with a lot more arguments against making resolutions to add to the list. So why do about 50% of Americans* still make New Year’s Resolutions? Because if you don’t know where you’re going, you’ll never get there. My business coach, Christy Wright, put that in words for me in a coaching session this past year, and I am making it one of my themes for this year. Goals are the road map for where you want to take your life, your family, your business, your hobbies. Goals give you a way to know if you’re staying in the same stagnant slump or making measurable progress. Let me put it this way—if you want to drive from Greenville to Seattle, you don’t get in your car and then sit in the driveway hoping you’ll move. You whip out your GPS device, plug in your destination, and put your foot on the gas. You’ll get to where you’re going when you follow a plan. So how can you create goals you’ll actually remember and keep? 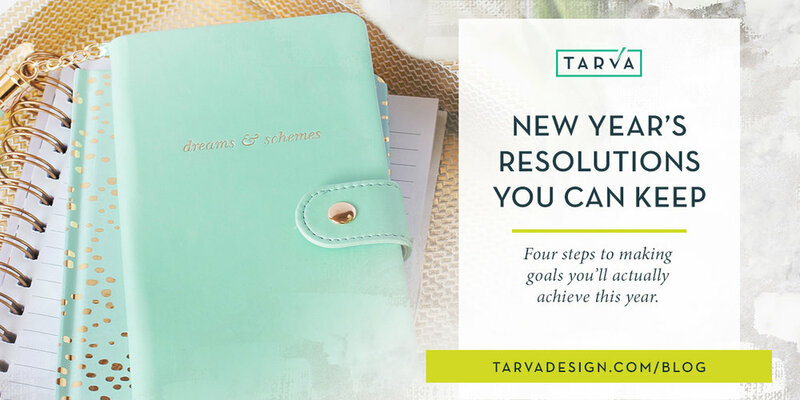 I have three steps for creating and keeping my New Year’s goals in a way that actually gets things done, and I want to share them with you so you can create a plan to accomplish your own goals. Step #1: You need to know what your goals actually are. The first year I made a list of goals and really took it seriously was 2012. Before that, I had took on each year day by day. I probably made progress in my life, but I didn’t really know what that progress was or would be. I didn’t have any concrete ideas of what I was working towards. That year I made twelve goals for the year (12 goals in 2012, really clever!). At the end of the year I could actually compare what I had wanted to do and whether or not I had achieved those things. That year I made measurable progress on each of the things I wanted to accomplish because I had planned out what I wanted to achieve. Every year since then—going on eight years!—I’ve kept on making goals when the new year rolls around. Even when I don’t end up completing all the goals on the list, I’m encouraged because I made steps forward. step #2: You need to make “SMART” goals. The “SMART” acronym isn’t original to me—to be honest, I don’t know the original origin— but I when I started to write down what made a good goal, it was exactly these things! SMART goals are specific, measurable, action-oriented, relevant, and time-bound. Phrasing a goal within these parameters make it more likely that you’ll take action to meet your goals. This wording would be more in line with a SMART goal. You would know exactly how, when, and why the goal is accomplished. Another example—you want to read more in 2019. The goal of “Read more” will have you making excuses all the way to December about the meaning of “more” (i.e. “Does one word more count?” “Do audio books count?”). Instead, formulate your goal as “Read twenty-four physical books by December 31, 2019.” Follow it up with a list of possible books and check them off as you finish them. Step by step, it will be done! step #3: You need to remember your goals. For the past eight years I have made what I call a resolutions journal with each goal written out. It’s small enough to carry with me and review my goals weekly or monthly to keep on track. To create your own, get a small journal or notebook you can carry with you. A small 3×5 notebook with a works perfectly for me. I can easily carry it around and mark things off as I accomplish them. Use two pages for each goal, writing the goal on the left side of the spread and leaving space on the right side to make notes about your progress or fill in the date you completed the goal. Consider adding whatever details are important to you at the time you accomplish your goal. Looking back to see what you’ve done will be more inspirational if you have a little of the story behind it. This visual goal-setting method from Being Boss partner Kathleen Shannon has helped me immensely in keeping my business goals on track. You can read more about the Chalkboard Method and download a PDF template from the Being Boss website. I have used a giant poster board with sticky notes as my “chalkboard,” but recently set up an Google Sheet to have my digital “chalkboard” with me wherever I go. This is a new one for me! I’m trying out Michael Hyatt’s Full Focus planner this year after informally following his method of goal setting in 2018. The Full Focus method helps you stay on track by intentionally looking back on your goals, and continually setting mini milestones to help you achieve on a bigger level. I especially like setting a quarterly, weekly, and daily “Big 3” to help me break down my annual goals into smaller steps. As I wrap up, I want you to remember that these goals aren’t set in stone—I’m talking to myself too here! You made them, and you can change them. I always make a note at the end of my goal list not to feel bad if I don’t accomplish every single thing. Focus on what you DO get done instead. Reevaluate the incomplete items at the end of the year as you think about your next year’s goals. Maybe some of the things weren’t really as important as you thought they were twelve months ago. With these four steps, I’ve come to really enjoy the process of goal setting each new year. I’d love to hear from you! How do you set your goals and how do you plan to get the awesome stuff done that you do? Leave a comment below to share with me your goals going into 2019. I’ve really enjoyed these three Lead to Win podcasts as I’ve considered my goals for 2019. I’m in no way affiliated with this group, they’re just definitely worth the listen!